Getting better all of the time! Time is a great healer, we've all heard. It may be hard to believe that we can ever heal when we've been hurt by someone we love. We tried hard. We gave everything we had; often to the point of neglecting ourselves and our needs. If the person causing you such grief is out of your life, that's good! You can now begin healing. It will take time; it will not be an easy time. If you have a good friend who understands you and is wiling to listen without judging, that will be a help. Counseling if you have access may also be a help. Try to create a support system for yourself. Along the way you will likely have the question "why????" screaming in your head. That's normal but don't spend a lot of time thinking about why. You've expended too much energy already on the creep and you now have to spend some time on you! When a relationship of any sort ends, your whole routine is thrown off. If you talked to someone at a certain time each day, or had any kind of routine that is now gone, it is normal to feel at odds, at loose ends, even craving the interaction. That's normal. Normal, but it must be dealt with. Dealing with a narcissist, sociopath or psychopath or even toxic person, will make you feel emotionally spent, drained. You may have even forgotten what it is that you enjoy but you will get there! Small steps add up over time. Some deal with a loss of relationships by over eating, over sleeping, drinking too much or turning to other substances in an effort to "forget" or get by. What you want are healthy replacements in your life! Please don't search out a replacement relationship right away. You have to heal and feel that you are happy and in control of your life. Only you can fix you! And that is as it should be. Give yourself some time to feel the stages of grief. There will be days when you feel great but then there will be days when you are sad, longing for the relationship. You know that the relationship was bad for you but you may be too focused on the good times you had. Would those brief good times be worth going back into a hurtful relationship? I thought not! But it is natural, normal, to have good and bad days. What is helpful is to create for yourself new, healthy routines. Get up each day and take care of your needs--showering, eat something. Lying in bed or staying at home won't help. Take a walk or do something you enjoy. Take up a hobby that will occupy your hands and mind. Time will help. There may always be pangs of missing the one you once loved. Just be kind to yourself and remember that is normal! Thriving After a Toxic Relationship: Not Just Surviving! Copy Julie Clark 2014. All rights reserved. Plagiarism will not be tolerated. Thriving After a Toxic Relationship: Just Not Surviving! My newest e-book is available! Chances are if you’re reading this you’ve had a relationship with a person who greatly troubled you. Someone who turned your life upside down and all around. There are many labels put on persons who harm others in non-arrestable ways: Narcissist. Sociopath. Psychopath. While there is a definite agreement with what constitutes a narcissist, it isn’t quite so cut-and-dried with what constitutes a sociopath versus a psychopath. The terms are often used interchangeably. So we will call them “toxic people.” Toxic people are not good for us. And we’ve learned that lesson the hard way—through experience. There will be many mini-lessons throughout this book but the first lesson I want you to learn is this: Psychopaths, sociopaths, and narcissists cannot be cured. They cannot be fixed. Not by the world’s best psychiatrists. Not by love…and not by you. You cannot fix a toxic person. The only one you can fix is you! Isn’t that a liberating thought—you cannot fix anyone! You can now focus on the most important person to fix—yourself! So, you know the person is toxic. He or she cannot be fixed. Picture a venomous snake in your mind—you cannot stop this snake from being deadly. When you even think of “trying again” to help the toxic person, remember the snake. If you have a snake phobia, think of something else that’s deadly toxic and when the toxic person comes to mind, associate him/her with something toxic. Do this each time to remind yourself to Not Touch! You deserve to be happy. And you will be. It may take some time. But once you realize that there is freedom after a toxic relationship, you will be happier! The worst has already happened—a relationship ended badly and you were hurt. Once you realize that the worst is over and you begin letting the toxic person go, you can begin to heal. 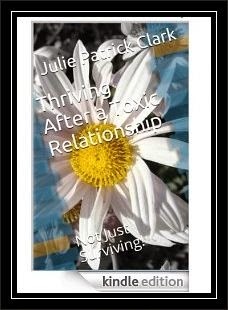 My newest e-book Thriving After a Toxic Relationship is now available on amazon.com! Relational Aggression: Spot it, stop it! Too many "experts" say that children should not feel shame when they hurt someone. But many of us know that when one doesn't feel shame, it is due to a lack of conscience. Is that what we really want--a child who feels no remorse or shame? When those children grow up they often abuse their partners or children. They are sometimes known as sociopaths, psychopaths, or narcissists. After being involved in anti-bullying for many years now, I see a lot of what constitutes bullying, or relational aggression. Everyone knows it is harmful. Bullies are many times more likely to commit crimes before age 24, and victims are susceptible to many problems, physical and emotional: cutting, depression, lack of interest in education and life, suicidal thoughts or actions. Yet, for all the press on what bullying is an what relational aggression is, there is precious little out there on what to DO about it! Many expensive programs are difficult and time consuming to implement. They are often watered down, or forgotten about in short order. It does NOT have to be hard or expensive! That's why I've written this short (41 pages, estimated) ebook for parents, schools, and organizations. Practical and commonsense, and ideas that you can start today! My second e-book is now available on amazon.com! "Stop Walking on Egoshells" is available on Kindle (if you don't own a Kindle, you can download a free Kindle APP) and read the book on your computer. My book brings reality home in a 100 couplets that will help affirm that you deserve better than a toxic relationship. Whether you are dealing with a narcissist, sociopath, psychopath, or toxic people, you will see that you are worthy of a real man. You deserve to be treated well, to be loved and cared for. Not cheated on, lied to, and neglected. Once you believe in yourself you will be able to make positive changes in your life! You must believe in yourself before you can make those changes. One small success will lead to another, and another, and another. I plan several more books in the near future and hope you enjoy the first one! Copyright (c) Julie P Clark All rights reserved. You’re better off without that jerk. Leave him alone and don’t turn back. Let him be your learning curve. Copyright Julie Clark 2014. All rights reserved. Welcome to my blog! Chances are if you’re reading this you’ve had a relationship with a person who greatly troubled you. Someone who turned your life upside down and all around. I have experience with a toxic person, so I can relate. This person was not a spouse but much of what I will be writing can apply to spouses, friends, anyone significant in your life. I am writing a book that I hope will be beneficial to others. I will blog a lot of it along the way as I write it. There are many labels put on persons who harm others in non-arrestable ways: Narcissist. Sociopath. Psychopath. While there is a definite agreement with constitutes a narcissist, it isn’t quite so cut-and-dried with what constitutes a sociopath versus a psychopath. So we will call these people Toxic Persons, or TP for short. Toxic people are not good for us. And we’ve learned that lesson the hard way—through experience. The book that I am writing will not be a scholarly textbook. It is not meant for a student in school. It is meant for those trying to understand and heal from toxic relationships. It can be difficult for ordinary people to determine if someone is a narcissist, sociopath, or psychopath. But we all know what “toxic” means. We know that toxins are not good for us. That includes toxic people. Let us not worry about their label. They are toxic, that’s all we need to know. Chances are, we’ve spent far too much time trying to figure them out. Let us now focus on ourselves. And as we learn we can pass along what we’ve learned to others, to help others who have also been hurt. And to hopefully help others before they are hurt. As we learn, we may be eager to tell others, to talk about what happened to us. You will be fortunate if you find a listening ear, someone who will let you talk and just support you. But chances are you will hear variations of “Stop obsessing!” “Get over it!” “Move on!” That is your clue that the other person either doesn’t know how to help you, or doesn’t want to take the time to understand. Or they may think that those useless phrases are actually helpful…it’s what they have heard repeated so much. There will likely be aspects that you will never be over. But you will be better. And you will be stronger! In your own time. There are times you will obsess, especially after a relationship has ended. This can be a marriage, a friendship, or relationship with a family member—mother, father, sister, brother, etc. Any relationship with close bonds that ends badly due to toxicity can cause severe emotional pain, anguish, heartbreak. Obsessing, at first, is normal. You go over and over in your mind trying to make sense out of what happened. You may have been trying and working hard on the relationship but no matter what you did, it wasn’t enough. Or the right thing. You were nice, empathetic, giving. Trying hard to be perfect. You overlooked little slights, hurts. Until they kept getting bigger. And more awful. They games that the TP played made you feel as if you were going crazy. And by the end of the relationship they may have convinced you, and everyone else, that you were the crazy one! Trying to make sense out of the senseless is crazy making. It’s like you’re faced with a 100,000 piece jigsaw puzzle. It seems hopeless, at first. But little by little, piece by piece, the pieces will fit. You will learn that you were not crazy. You were normal, trying to make sense of crazy. The jigsaw puzzle may not ever be entirely finished. That’s okay. Eventually, you will fit enough of the pieces together to see the bigger picture. That’s enough. You don’t need to see the entire train before deciding to stop at the warning lights do you?! All content copyrighted Julie P. Clark. 2014. Please ask permission before using content on this blog. Copyright Julie Clark 2014. All rights reserved; plagiarism will not be tolerated.. Theme images by merrymoonmary. Powered by Blogger.